Heads up Inglewood!! The Black Keys are back with promises of an all-new album waiting in the wings and a MASSIVE North American tour. As if that wasn’t enough, they’re joined by Modest Mouse and Shannon and the Clams!! This incredible lineup is headed to The Forum on Tuesday 19th November 2019 – what are you waiting for?? Tickets are on sale now and selling out quick – be quicker and get yours while you can!! Remember, no booking fees or service charges for any tickets bought direct from this website! 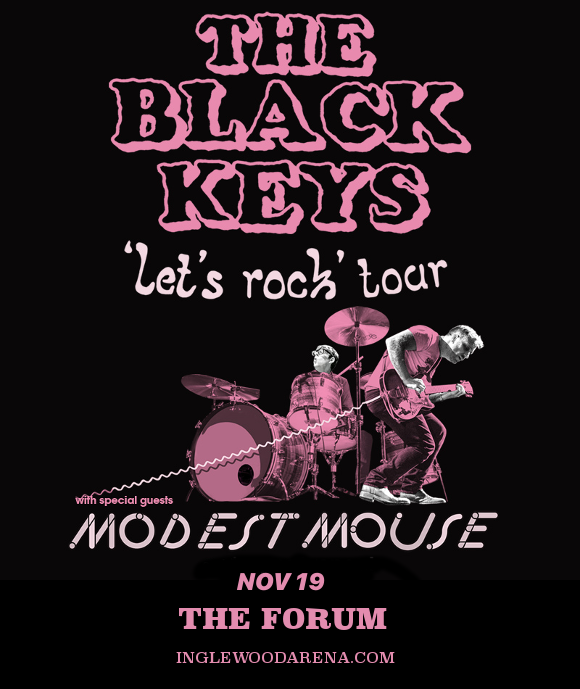 Formed in Ohio by guitarist/singer Dan Auerbach and drummer Patrick Carney in 2001, the Black Keys released their first album “The Big Come Up” in 2002 and built up an underground following over the next 10 years before simply exploding onto the mainstream music scene with their album “Brothers,” featuring the single “Tighten Up,” which won the duo no less than 3 Grammy Awards, universal critical acclaim, and new fans the world over. After a 5-year break since their last album, they’ve announced the tour in the wake of their new single “Lo/Hi”. The new single has been described by critics as "rich" and "gospel-style", continuing on from the mellow sounds of their latest, and hugely successful album “Turn Blue”. They’re joined in 2019 by special guests Modest Mouse and Shannon and the Clams, making this a show that you’re sure not to forget in a hurry! We can hardly wait to experience it all live – can you?? No?? Then hurry and grab those tickets – they won’t last long!